If there’s one thing I know about Black Friday is that you need to keep your wits about you. I can’t help but picture the Friends episode, The One with the Cheap Wedding Dress. Think grabbing and punching and stress and queues and hanger and and and… But thankfully, we don’t have that kind of Black Friday tradition here yet. 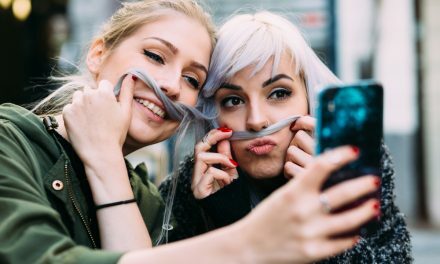 The majority of local sales are online and, as such, the only thing you need to worry about is staying awake for when that clock hits 00:00 on Thursday night/Friday morning. Sugar rush, anyone? Black Friday actually started in the 19th Century. A few years ago I felt uncomfortable about its origins after reading that it came from a rather nasty post-Thanksgiving tradition. But upon further research, I’ve discovered that that origin story is not true and that it, in fact, comes from people taking the day off after Thanksgiving and starting their festive shopping early, basically. Approximately half of people’s Christmas shopping is done on this day. So it seems that the name actually comes from an accounting term, “in the black”, which basically means to be making a profit. Regardless of history, I love a good sale. One can’t escape the consumerism that wafts around a manic sale though and I think a pro-tip is to create a wishlist for yourself before. Rank things in order of necessity and try to avoid impulse-buys you might later regret. There are a few companies which have turned Black Friday into a community-focused event though, like “Give Back Friday”, where companies donate a percentage of their profits. Faithful to Nature is doing “Black5Day” and will be giving a percentage of their profit to the Endangered Wildlife Trust, to support them in all the incredible work they do for animal conservation in Africa. A worthy reason to stock up your pantry, for sure. If I can order everything online and never have to go to a store, I will. The convenience is just too tempting. In celebration of “Black5Day”, we created Black Friday Black Pavlova. 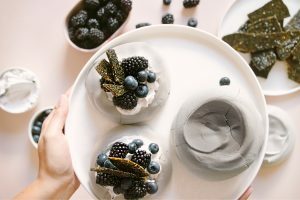 These mini pavs contain black activated charcoal and are made from aquafaba. 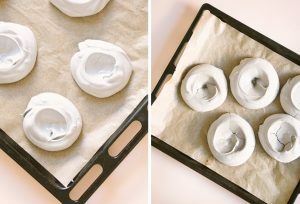 If you’ve followed for a while, you’ll know this is our go-to recipe for meringues and we’ve used it in our Pink Vegan Meringue Kisses and more recently, Ghoulishly Easy Ghosts. 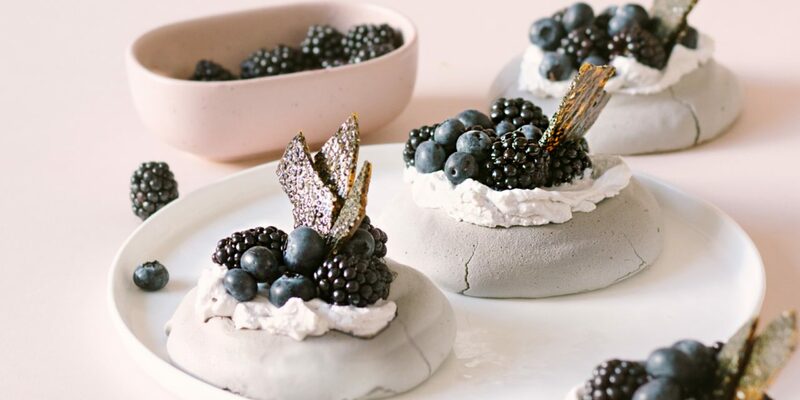 The result this time is a soft grey meringue which nests the white coconut cream and beautiful seasonal black coloured berries perfectly. They come together quickly and are impressive to serve. 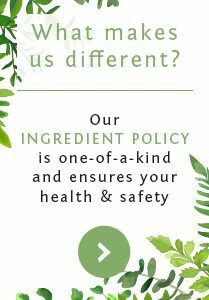 Most of the ingredients can be bought from Faithful to Nature too. This recipe is simple to adapt to a Christmas theme, or simple to whip up to help you punch up your shopping energy. Sugar will do that! And so will eating things equal parts pretty and delicious. Preheat your oven to 100 degrees celcius and line a baking tray with baking paper. 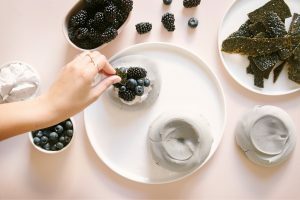 In a small bowl whisk together your sugar, activated charcoal, arrowroot starch, and salt. Set aside. In a large glass/ceramic/stainless steel bowl add your chickpea liquid and apple cider vinegar. Start by beating on low and gradually increase the speed to high. Keep beating until the liquid forms stiff peaks. This can take anywhere from 5 -15 minutes. You’ll know its reached stiff peaks when you can tilt the bowl upside down and not have the mixture doesn’t run out. Slowly start adding your sugar mixture, a tablespoon at a time, continuing until all the sugar is incorporated and you’re left with a glossy meringue mixture. Add the vanilla extract and black gel food colouring and beat for a further minute until incorporated. enough space between each one as they expand in the oven. Use the back of the spoon to create a nest in the center, scoop some meringue back into the bowl if necessary. Bake on the middle rack for 2 1/2 hours or until the outside is dry to the touch and when tapped sounds hollow. Turn the oven off and allow to cool completely. In a heavy based saucepan add your sugar and 2 tablespoons of water, dissolve on high heat until no sugar crystals remain. Once your sugar is dissolved and starts bubbling reduce the heat to medium and working quickly add your sesame seeds 1/4 cup at a time. Pour onto your baking sheet and tilt the tray to create a thick even layer. 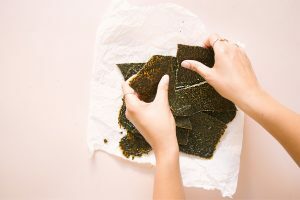 Let cool for 30 minutes and using your hands break into shards. 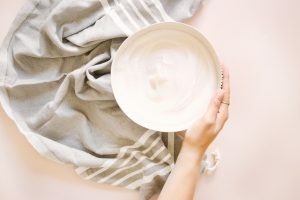 Add your coconut whipping cream to a medium bowl and beat on high until fluffy. Carefully remove the pavlovas from the baking paper and place on a serving plate. Top with a spoon of whipped coconut cream, fresh berries, and sesame brittle shards. I am a recent vegan convert & am so thankful for your amazing recipes. Please, keep them coming!